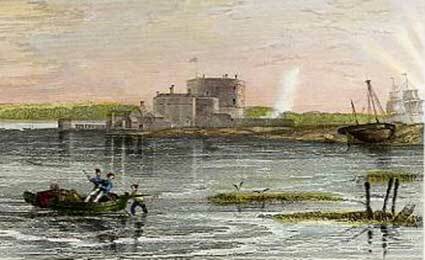 Calshot Castle was built by Henry VIII as an artillery fort at the mouth of Southampton Water. Its purpose: to defend the sea passage to Southampton. Constructed in 1540, it was one of a number of coastal defences built between 1539 and 1547 following the beginning of the English Reformation, a period during which England broke away from the authority of the Pope and the Roman Catholic Church. High on the list of potential aggressors was staunchly Catholic France, motivated by a desire to right what was considered to be a religious wrong and also by territorial ambitions. Conveniently available stone and lead from Beaulieu Abbey, which was largely demolished when processes associated with the Dissolution of the Monasteries (1536 - 1541) allowed Henry and his favourites to seize control of many religious houses, were used in the construction of the castle, but in the event, invasion did not materialise. Calshot Castle is open to the public from April to September - full details of admission charges and opening times are available from English Heritage. (Note: There is no admission charge to Calshot Castle for members of English Heritage). Situated towards the seaward end of a long shingle spit extending from Milford-On-Sea to within ¾ of a mile of the Isle of Wight, Hurst Castle was originally built to defend the western approach to the Solent. Completed in 1544 as part of the chain of coastal fortresses built during the reign of Henry VIII, the castle was strengthened and extended at various times, particularly during the 19th century when attacks by the French were feared, culminating in a major reconstruction during the 1860s and early 1870s. Hurst Castle also saw service during World War Two when, for example, new gun positions were established and a look-out tower built. As at Calshot, stone and lead from Beaulieu Abbey were used in the original construction of Hurst Castle. In 1648, during the English Civil War, Charles I was famously imprisoned here before being taken to London for trial and eventual execution. 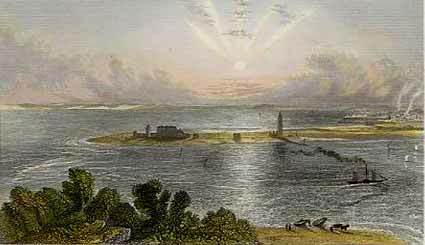 Hurst Castle was, though, also the abode of another less well known prisoner, Father Paul Atkinson, who was harshly sentenced to perpetual imprisonment in 1700 for 'popery', for celebrating mass and / or carrying out other priestly functions that encouraged the spread and growth of Catholicism. Father Atkinson remained at Hurst until his death in 1729. Over the years, a number of lighthouses have been constructed to warn sailors of the perils associated with Hurst Spit and the racing tide between the Spit and the Isle of Wight. But perhaps most surprisingly, certainly to modern day visitors, settlements outside the castle walls developed over the years to serve the garrison, smugglers, excise men, salt makers, lighthouse keepers and others brave enough to face the often harsh elements at the end of the Spit. Today, though, little remains to remind of these once vigorous communities. Hurst Castle is usually open daily from April to October, and at weekends from November to March. Full details of admission charges and opening times are available from English Heritage. (Note: There is no admission charge to Hurst Castle for members of English Heritage). The castle can be reached by walking along the shingle spit or by taking a ferry from Keyhaven harbour.